Are you looking for a large garage or shop? Look no further! 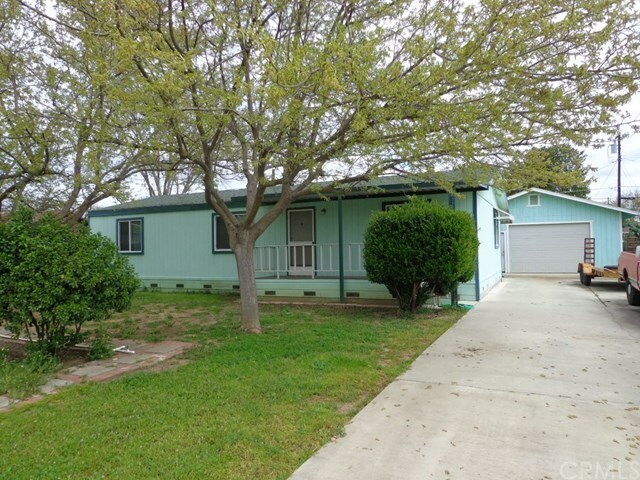 In addition to the 3 bedroom, 2 bath manufactured home, this property boasts a 24'x40' detached shop/garage with space for 4 cars. It is designed as a drive through, with concrete driveway at the front, and concrete at the rear exit to the alley. Alley access is gated and can be locked. The long front driveway can easily accommodate an RV and has RV hook-ups. Also located in the rear, fenced yard is an approx. 12'x16' detached building that has electricity and is finished inside. The current owner uses this space as a workout room. The home has been well maintained and has a newer roof. Property is located in an un-incorporated area of Glenn County (not City of Willows); however it does have city sewer and is hooked up to Cal Water. Directions: From Hwy 162, go north on 4th Street. Home is on east side of street just before Cherry St.